Servicing North Adelaide including Prospect, Campbelltown, Glenelg, Elizabeth, Henley Beach and beyond. 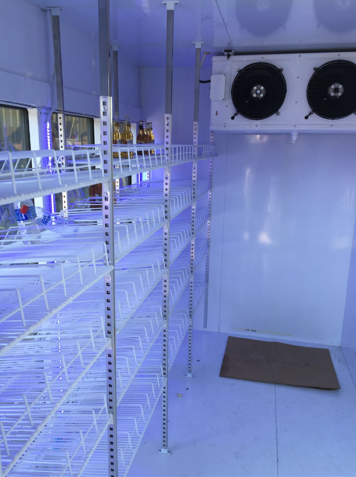 If you need a far greater volume of refrigerated or frozen storage space, you probably know that the most cost-effective solution is a cool room or walk-in freezer. For your store, restaurant, warehouse or factory, you can depend on us to be able to cool that storage room by 30°C or more. We have ample experience in installing the air coolers, vents, water supply and distributor for efficient cool rooms and walk-in freezers. That room will be another world by the time that we’re done with it. Cool rooms are what you need for the efficient mass storage of meat, fish, fruit, vegetables, cereals, flours and so on. Refrigeration is the miraculous storage-life extender of almost any perishable. Walk-In Freezers are at 0°C at the absolute maximum. The deep cold of these rooms can keep meat fresh for up to one year. More refrigerated storage space can do wonders for your business’s logistics. Many of our customers now save money by buying their perishables in greater bulk. If you only need a refrigerated space inside a compartment, we can install it for you. We can increase the size (or decrease the size) of your cool room or walk-in freezer. We take care and use quality thermostatic parts to ensure that your refrigerated room always remains a constant temperature. Call 0430 039 981 now for a free quote! Shiraz Refrigeration and Rima Appliance Repairs.